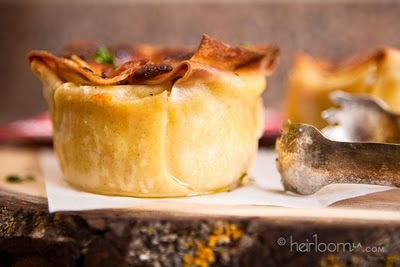 I’m going to be catering my lovely sister’s wedding in May (! ), along with making the wedding cake (!!). So I’ve been testing a lot of recipes. Here’s a peek into my recent culinary adventures. I started off with an appetizer. Well, appetizer, or small meal, or sandwich replacement. Basically, I had been reading raves about the Cupcake lasagna creations from Heirloom LA, and I became obsessed with trying to recreate them. For a wedding, these are perfect. They can be served on a buffet, plated, or even tray-passed. They are substantial on a day when a fair amount of imbibing will take place, they hold their heat very well, and you can easily put together vegetarian and carnivorous versions in the same pan. The variations are endless. Grab whatever produce is in season (summer squash, baby spinach, sweet corn, broccoli), add some great proteins (braised short rib? Veal shank? Mushroom ragout?) and smother in cheeses. For my test, I put together a spinach and turkey sausage version. From the beginning, I was pretty sure that I should not skimp on the béchamel. 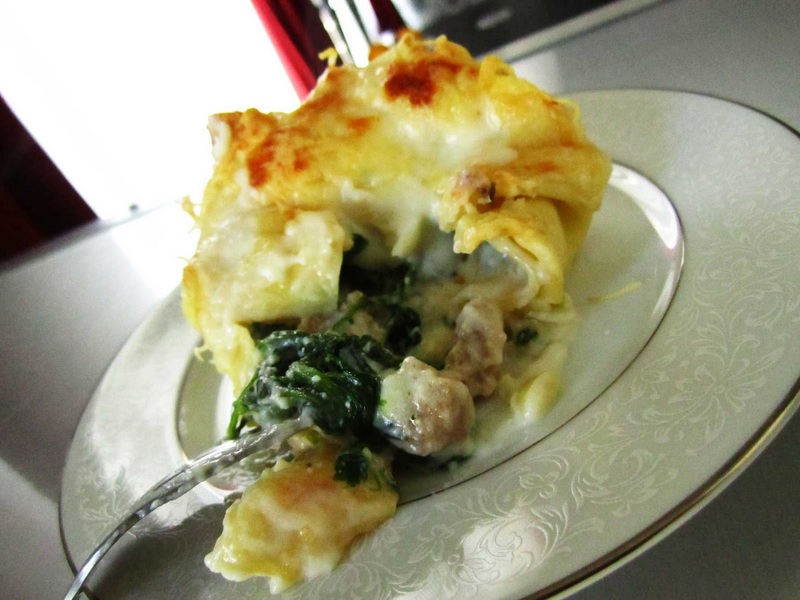 I used the barilla lasagna noodles that don’t require pre-cooking, cut the noodles in half, and then loving folded them around layers of fontina, spinach, turkey sausage, béchamel, and parmesan. And they were glorious. Gooey, meaty, creamy, cheesy, and compact. This is now my go-to party snack. I took a plate to a superbowl party. I made them for a girls’ night cocktail party. My friends are going to get absolutely sick of seeing these. But new love can obnoxious sometimes. 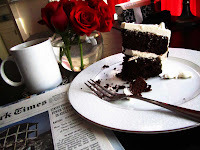 A couple of days ago I also pulled together Martha’s one-bowl chocolate cake and swiss meringue buttercream. The cake I’m making for the wedding is going to be very simple, just three tiers of white icing with a black satin ribbon band and blue flowers. My puzzle is this: must I fondant? Or will a buttercream do? 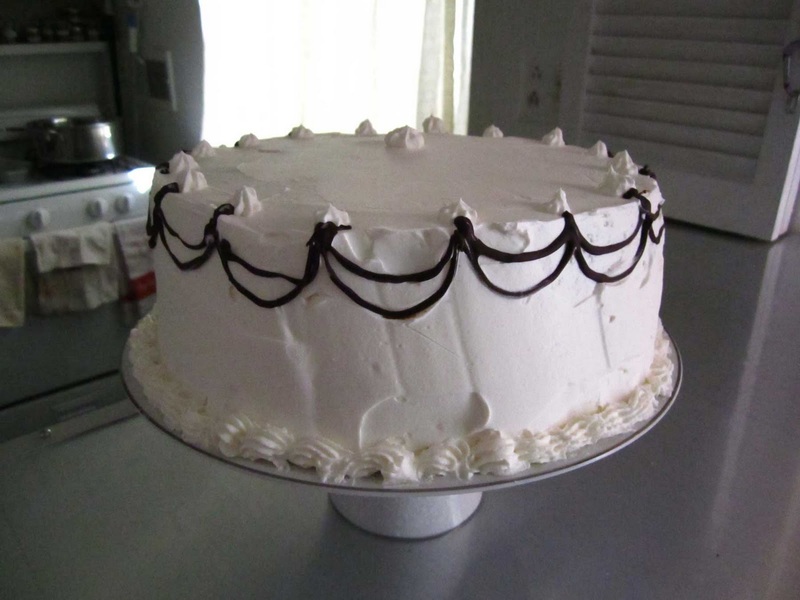 Swiss meringue buttercream has the added structure of egg whites to keep it shelf stable, and I’d never really made one before. So I followed Martha’s cake tutorial to a T.
I liked the result. 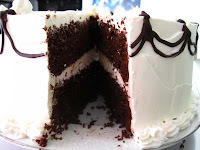 The cake had a nice flavor, and the buttercream… cloudy, fluffy, and just the right balance of sweet and buttery. But I also know that I will potentially be worrying the whole ceremony that the cake is melting. So, In the coming week, I’m moving on to a marshamallow fondant test. It’s an incredibly tough job, but the test cake also makes a great Sunday breakfast…. 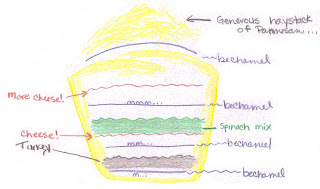 My cupcake lasagna recipe after the jump…. Try as you might, you will not find an official cupcake lasagna recipe from Heirloom LA posted anywhere on the interwebs. There are many others, (some even using won-ton wrappers rather than pasta noodles). The main question is ‘how do you actually fold the lasagna noodles into the perfect little pouches?’The trick is to be generous with the non-stick cooking spray, and then stop worrying about it. They’re supposed to look a little rustic. Make the bechamel and keep warm. Cook the turkey sausage until browned and just cooked through. Cover and keep warm. Saute the garlic in a pan with the butter and olive oil, add the spinach and cook until just wilted. Drain any excess water from the spinach pan and mix spinach with ricotta cheese, salt and pepper to taste, and add the pinch of nutmeg. Prepare the pasta noodles according package directions (for the no-cook noodles, soften in warm water). Cut noodles into 3 inch squares. 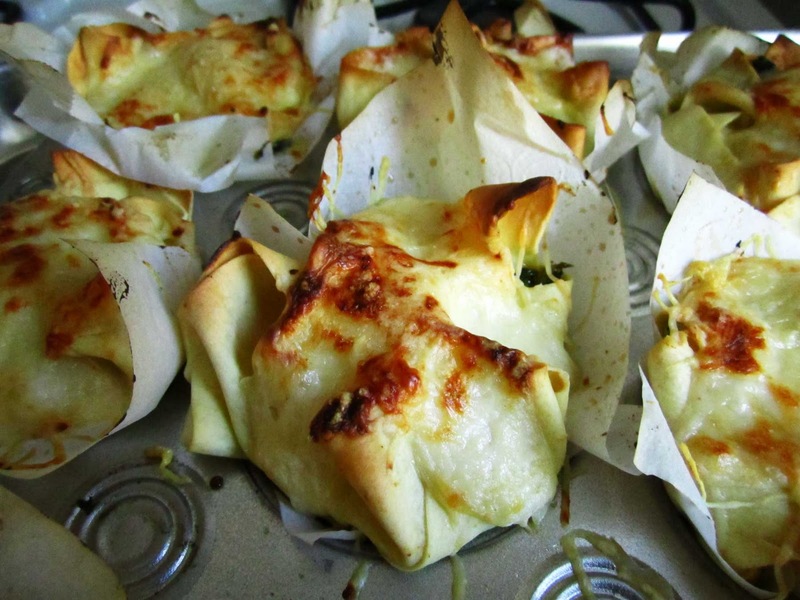 Spray a muffin tin with non-stick cooking spray and lay in three squares of pasta, fanning them so they cover all sides of the tine. Layer each lasagna first with a tablespoon of bechamel, followed by turkey, then fontina, spinach mix, bechamel, and a final layer of fontina. Fold the ends of the noodles over the top of the lasagna, seal the tops with another tablespoon of bechamel, then sprinkle on a generous haystack of parmesan cheese. Bake in a 375 degree oven until browned and bubbly. < Previous What would Danny Meyer Do? 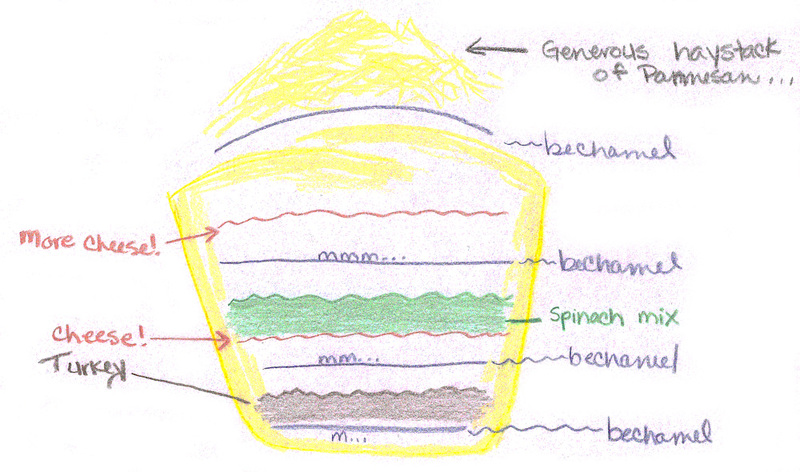 >THANKS for posting the cupcake lasagne recipe (and cute diagram!). What a great idea. I'm definitely going to have to try it.P.S. The cake looks fabulous. >This is going to be the most delicious wedding EVER. >You're out of control, Mary. I can't wait to somehow reap the benefits of your many, many skills. Yes, I am that self-involved. Yes, you are that talented. >I agree with Rebekah! If you want to come to Chicago and try out recipes with me I'd be happy to give my help tasting! You should be on the lookout for 1-time cake-decorating classes. I've done a cupcake decorating class, and another decorating-cakes-with-fondant class which really helped my confidence, and I'm not even doing anything as legitimate as a wedding! Good luck my dear! >Wicky– a chicago trip in the upcoming months is an absolute MUST. I am keeping my ear to the ground on the cake-class front, too. Ces– So excited that you are entering a culinary program! As far as interning, I might be able to get you in with the resto where I manage right now (we are always looking for a few extra hands). I will check in that. Email me your contact info (mary@wherethesideworkends.com). Can't wait to hear how the recipe turns out!